While it seems like every industry is being influenced and changed by evolving technology, there is one item that is more steadfast than ever: the good old fashioned business card. If you consider each of your business cards a chance to make a connection with a potential client or investor, it’s easy to see why an eye-catching business card so important. A beautiful letterpress business card design by cheekycreative. But let’s be real: lots of your cards might end up lost or thrown out. So how can you make sure people hold on to your card and remember your name? Easy! 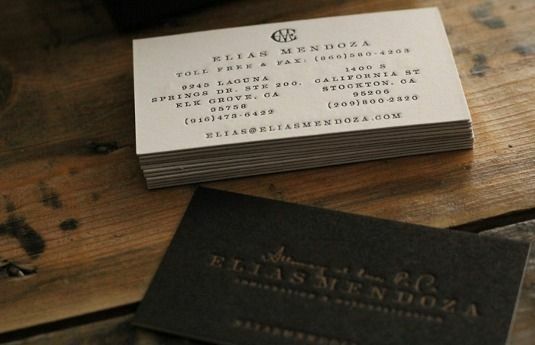 Pick the right fonts for your business card. While a strong logo plays a big part in a great business card, the right font choices can’t be overstated. Your font is what really drives your message home. Read on to learn more about the best business card fonts that are making moves in the business world, as well as which kinds of brands they suit best and why. This design combines light illustration and a sans serif font by ruaran. A sharp die-cut design for an interior designer by gemmyvn. Clean sans serifs like Arial, Helvetica and Myriad Pro are perennial favorites. And for good reason—they’re clean, respected and can serve any business from a design or tech startup to a general contractor. They tell people you’re modern, up-to-date on trends, and appreciate efficiency. They normally have large ranges of styles and characters—which means more weights for you to combine into a perfect design. Note that these sans serifs are not always a great choice for business cards that are trying to send a more human message. A lighthearted design by kendhie for Holly George. Cards that are anchored by a calligraphic or script font exude warmth. This is the type of business card font that tells potential clients to reach out anytime. They are especially great if you’re self-employed and trying to build a personal brand for yourself or if you want your business to feel personal and individualistic. If you have a strong, readable signature consider digitizing it, otherwise custom calligraphic logos are a great choice. Another vintage design for a brewery. Business card by Hart Design. A unique rustic card design for a doctor’s office. Design by hyakume. Vintage-style fonts are all the rage in graphic design these days, so it’s not surprising they’ve found their way onto business cards. Worn type brings a classic vibe to your brand and works well for industries that have been around for a while since they tend to make everything feel a bit more crafted and bespoke. Not that they can’t be successful in other arenas—check out hyakume’s design for a truly unique card for a doctor’s office. Classic fonts like Clarendon and Rockwell will work perfectly well especially when layered with worn textures. But keep in mind materials matter with these designs: kraft paper will make the card far more attention-grabbing than plain white and if you have the budget, step up to a letterpressed card for a truly artisanal experience. 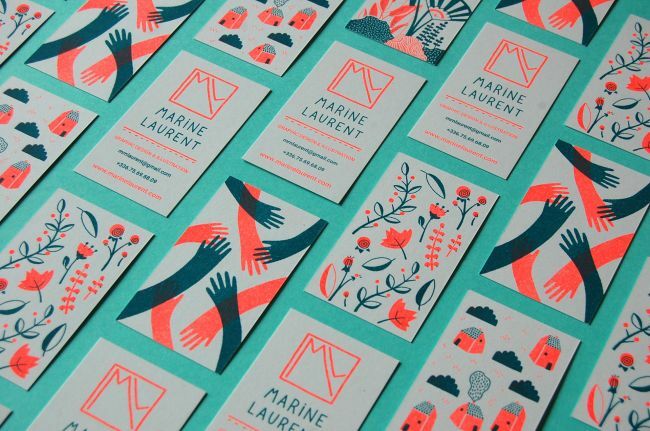 A lovely, feminine design for a handcrafted beauty brand. Business card by J U L I A M A R I E.
This mortgage corporation companycard is stately without being boring. Design by Rose” for Nation One Mortgage. Serifs are arguably the most classic and refined looking fonts, projecting steadiness and reliability. Plus they’re highly readable at small sizes. This is an important aspect when thinking about business cards, which normally max out at 3.5 inches wide. Serif fonts like Bodoni, Caslon and Garamond will always be a solid choice for the tiny phone numbers and email addresses on the bottom of your business card. But there’s no need for them to be boring—in a crowded marketplace of photographers, there’s no doubt “Regular Phil the Picture Taker” wouldn’t stand out to someone looking for a bit of fun in their photography session. A playful, friendly design by hypdesign. Who says the business world can’t be fun? These are the fonts that add personality and quirkiness to your card! If your business is part of an industry like childcare, petcare, or outdoor recreation, a stodgy sans-serif card might actually turn potential customers and clients off. The perfectly executed card in this sphere is playful without being irreverent, fun while still taking the job seriously. Like with the calligraphic cards above, a custom design will always be best. That said, there are plenty of fonts available that are lively without being outright silly—try Avenir Rounded for a serif that also feels fun or the ever-popular Lobster for a boisterous, but still readable, script. Corporate cards can still be elegant, as this design by Rose” shows. If you already have a stunning logo design, you have the foundation for a fantastic business card. But how to integrate that illustrative element with text? If your illustration is large enough, use the whole side of the card, saving the other side for the contact info. If it’s not large enough you can also tile it into a pattern. With professional printing options so readily available, die-cutting is now an option to any entrepreneur or small business owner. The music studio card designed by rikiraH is unconventional but is sure to be a conversation starter! However it’s arranged, make sure the text and illustration feel like on cohesive whole. The card for the sustainable architecture company works because it’s sparse and modern and also because the lines of the font and the logo are the same weight and style and so feel harmonious. While many are forced to carry boring corporate branded business cards, entrepreneurs and small business owners have a unique opportunity to create a card that truly captures the personality and spirit of the companies they lead. Whether you’re looking to rebrand an existing business or launch an entirely new company, make sure your business card looks its best. Careful font choices and thoughtful branding will help insure you and your business put your best foot forward into the marketplace.